That being said, my goal here and right now is not to promote this book. I thought to share with you what the author, who is recognized as a management and leadership guru worldwide, Ken Blanchard said about Jesus. He wrote, “Everything I had ever taught or written about effective leadership during the past thirty-five years, Jesus did to perfection, beyond my ability to portray or describe. I realized that Christians have more in Jesus than just a spiritual leader; we have a practical and effective leadership model for all organizations, for all people, for all situations.” I conquer! That is why based on my book entitled ‘Soft Skills That Make or Break Your Success’, I will use Jesus as a role model and show you, in my upcoming Facebook live chats, how the 12 soft skills recognized in the book allowed Jesus to succeed in His earthly ministry more than 2000 years ago. Those of you who are interested to read the book, which is written for anyone regardless of your religious affiliation and based on a case study in one of the leading research organizations, is available on Amazon. 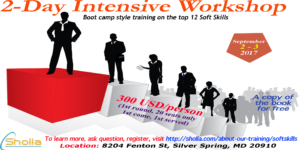 However, as a way of giving back to the continent I came from, Africa and my own fellow Habesha leaders, professionals, and business owners who understand English, I’ll show you how Jesus, other Biblical characters, and past and contemporary leaders from the corporate world have had these soft skills that contributed to their outstanding success. I’ll share with you insights, stories, and most importantly, tools that can help you take your already existing soft skills to the next height. This is especially transformational to the immigrant community in the Diaspora. Your talents, gifts, intellect, hard work, and so on aren’t enough to succeed in the West. You need to develop the 12 soft skills that make or break your success in the new culture you live and work. Remember, I wrote this book based on my experience as a trainer for some government agencies, major corporations, and non-profit organizations. These organizations pay thousands of dollars to offer workshops to their leaders, managers, supervisors, and team members on these themes. Thus, don’t miss this opportunity. It’s free. I’ll post more updates before the launch of this Facebook live chat. In the meantime, I’d like to hear your suggestions. I also encourage you to share this good news with the people you know who may benefit from this program. Latest statistics show that the world has the largest youth population ever. The sad thing is that the youth have been victims of so many challenges including unemployment, crime, and the lack of opportunities. If the young people are empowered to become leaders and given a chance to take the lead, they could overcome the other challenges they are facing. If the youth are enabled to take charge, they are more than able to shape their own destinies. Not only that, if the baton is transferred to young people, they could have contributed their fair share in tackling the major ills the world as a whole is confronted. That is why we at PRO Leadership are committed to bridging the generational leadership gap. What would be your role to bridge this gap? 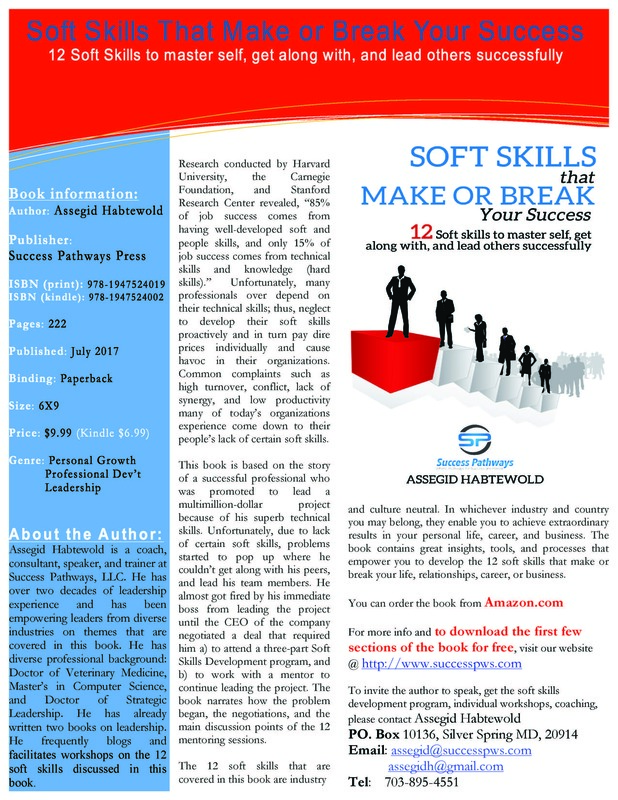 Soft Skills That Make or Break Your Success: 12 soft skills to master self, get along with, and lead others successfully by Assegid Habtewold- a leadership expert and soft skills workshop facilitator, is now available. The book is based on a story and shares great insights, approaches, and tools essential to develop the 12 vital soft skills that make or break one’s success. 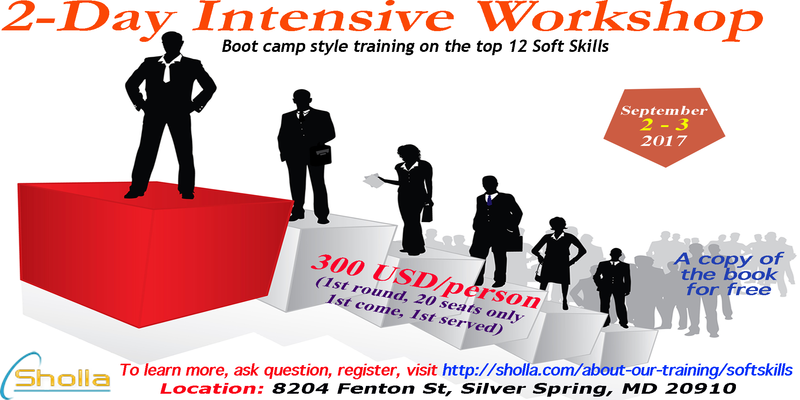 Silver Spring, MD, July 13 2017 (Success Pathways Press)– Research conducted by Harvard University, the Carnegie Foundation, and Stanford Research Center revealed, “85% of job success comes from having well‐developed soft and people skills, and only 15% of job success comes from technical skills and knowledge (hard skills).” Unfortunately, many professionals over depend on their technical expertise. They neglect to develop their soft skills proactively and in turn pay dire prices individually and cause havoc in their organizations. Common workplace complaints such as high turnover, conflict, and low productivity many companies experience come down to lack of certain soft skills. The book is based on the story of a successful professional (Dan) who was promoted to lead a multimillion-dollar project because of his excellent technical skills. Unfortunately, due to lack of some soft skills, problems started to pop up where he couldn’t get along with his peers, and lead his team members successfully. Dan almost got fired by his immediate boss (Susan) from leading the project until the CEO of the company (Paul) negotiated a deal that required him to attend a three-part Soft Skills Development program and to work with a mentor (Rafael) to continue leading the project. The book narrates how the problem began, the negotiations, and the main discussion points of the 12 mentoring sessions. Each chapter summarizes the three key talking points of Dan and Rafael: a) Four insights Dan gained from each workshop, b) The assessments, processes, models, and tools he found helpful, and c) Immediate actions he plans to take as a result of attending that particular workshop. Data that show how soft skills play the lion’s share for one’s success. Here are just two examples: “46% of new hires fail in the first 18 months, and 89 percent of them failed for attitudinal reasons [soft skills]. 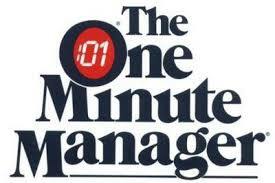 Only 11 percent failed due to a lack of hard skills.” “More than 1 million employed U.S. workers concluded that the No. 1 reason people quit their jobs is a bad boss or immediate supervisor.” Such bosses lack the vital soft skills necessary to get along and lead their team, and thus, they cause chaos, high turnover, and low employee morale. Stories like Nikola Tesla- the legendary inventor, who died poor and in isolation due to lack of soft skills. President Donald Trump’s Twitter war with President Enrique Pena Nieto over US-Mexico border to illustrate the vital role soft skills like negotiation play to get along and lead high stake negotiations between nations. The book offers some key lessons from this Twitter feud between two presidents that can be used in any negotiation. Some stories of the author including the culture shock he experienced during his early days in the US, and how he worked on his cultural intelligence to get along with diverse people in his new home. He also shared latest practical examples, case studies, and lessons he learned from his readings and experience as a former professional and now a facilitator of soft skills workshops. The 12 soft skills that are covered in this book are industry and culture neutral. In whichever industry and country you may belong, they empower you to achieve extraordinary results in your personal life, career, and business. The book contains great insights, tools, and processes that enable you to develop the 12 soft skills that make or break your life, relationships, career, or business. Assegid Habtewold is a coach, consultant, speaker, and trainer at Success Pathways, LLC. He has over two decades of leadership experience and has been empowering leaders from diverse industries on themes that are covered in this book. He has diverse professional background: Doctor of Veterinary Medicine, Master’s in Computer Science, and Doctor of Strategic Leadership. He has already written two books on leadership. 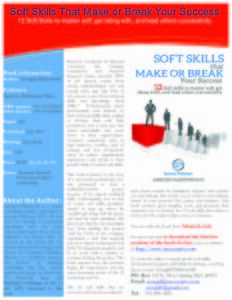 He frequently blogs and facilitates workshops on the 12 soft skills discussed in this book. New York Times reported that David Bonderman resigned from Uber Board after sexist remark. Because of this spillage, Bonderman was forced to resign. This shows that many men (some Women) may have both conscious and unconscious biases that discriminate women but far from the truth. This requires actions at multiple levels. It calls to take proactive measures than just reacting when these kinds of biases surface. We at PRO Leadership are committed to contribute our share at all levels.